Military friendly campus: That’s us! America’s veterans deserve an easy transition back into civilian life when they move on to college, and University of Wisconsin–Stout has worked to assist its veterans throughout the years. In honor of Stout’s efforts, the school has received the Military Friendly Campus award from Victory Media for the fifth year in a row. “We’ve done a number of things with getting additional resources to support veterans on campus,” said John Bensend, Stout’s Military Education Benefits Coordinator. Bensend’s main job on campus is to ensure veterans and their spouses or dependents receive the education benefits they earned through service, but that isn’t all he does. 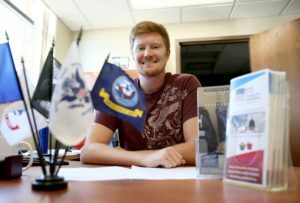 He has served as a point-of-contact for veterans looking to move into Menomonie as well as assist them in networking with their fellow undergraduates. “A lot of time we end up covering [the small thing] because our people like to have one point-of-contact and have somebody they can trust and work with,” said Bensend. “We work heavily with our student veteran organization as a way to get veteran students in contact with other veteran students,” he said. “Peer to peer seems to work the best, especially when you’re trying to navigate through college. It always seems to help to have a friend or somebody you can relate with.” It is for this reason that the Veteran’s Club on campus exists. Tyler Fregine, sophomore and vice president of the Veteran’s Club and a student in the Department of Veterans Affairs work-study program, believes the club serves an important role of connecting veterans. This year and next are exciting times for the veteran’s programs on campus as the facilities have and will continue improving. In January, construction is expected to begin on a Military and Veterans Resource Center on the third floor of Bowman Hall. It is expected to open in the spring of 2015. This space will provide veterans with a place to receive assistance when they are in need. Stout currently services about 368 veterans and military students.